Seagull’s Maritime guitars are their 2nd tier series. They fall only behind the Artist series in their line-up. But even though they are high up in the Seagull hierarchy, they are still really affordable for the quality you get. Something that Seagull also manages with their Artists Series. And you’re still looking at all solid wood guitars here – which makes the prices of these guitars even more impressive. Below is the line-up of the Maritime series. All guitars in the Maritime Series come with a Solid Spruce top and either Solid Mahogany or Solid Rosewood back and sides. We’ll see how each model differs when we take a look at the models individually. There are 9 different models in the Maritime series. O.k. let’s take a look at each guitar individually. You’ll probably have some clue as to the differences based on the names of the guitars. Also check out the link below to learn more about some of the features that are in Seagull guitars. 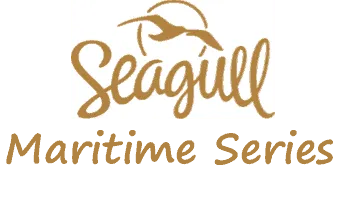 All prices listed below are in US Dollars (roughly converted from Canadian Dollars – Seagull is a Canadian brand). As I usually do with these series features, let’s begin with the Dreadnought models and start with the most basic model. In this case that’s the Maritime SWS SG. This is the lowest priced model. One of the features of a lot of Seagull guitars is the nut width. This is wider than the typical nut width on most Dreadnought acoustic guitars. So, if you prefer a wider neck for that extra string spacing, then this could be a good option for you, assuming you like the tone and feel of it, of course. An all solid body acoustic guitar for less than $1,000 is hard to come by. If you need a cutaway, then the Maritime series guitars won’t be suitable for you. None of them have cutaways. However, if you need electronics, each model has an electric-acoustic version. So the electric-acoustic version of the Maritime SWS SG is up next. Of course you pay slightly more for the electric-acoustic model as you’d expect. But it still comes in well under $1,000. An electric-acoustic all solid wood guitar for that is awesome. O.k. so the only difference between this and the non electronic version is…. well, that it has built electronics! Maritime SWS SG QIT comes with Godin’s Quantum IT (QIT) electronics with built in tuner. The QIT electronics aren’t top of the line – but they’re pretty good, especially given that they don’t add much to the price of the guitar. If you want really top of the line electronics, then you’d be better off getting the non-electronic version and then having electronics installed. This will be the more expensive way to do it though. For your average user the QIT will do the job just fine. It’s a single source UST pick up so it’s never going to be as good as a multiple source pick up – but as far as a single source pick up goes, it’s one of the better ones. The next model we’ll look at is the Rosewood version. The biggest difference between this and the Maritime SWS SG is that it has Solid Rosewood back and sides in place of the Solid Mahogany back and sides on the Maritime SWS SG. The other significant difference is that it has a narrower nut width. The Nut width on the Maritime SWS RW SG is 1.72” (43.7mm) as opposed to the nut width on the Maritime SWS SG which is 1.8” (45.7mm). So if you prefer that narrower nut width, then this is your best option. Also, if you prefer the sound of the Rosewood back and sides. This will typically produce brighter trebles and more bass than the Mahogany. It’s not necessarily better but some prefer it over Mahogany. This is simply the same as the above except that it has the In built QIT electronics. The last of the dreadnought models is the Burnt Umber model. This model only comes with electronics, there is no non-electric-acoustic version. Otherwise it’s pretty much the same, so the choice between this and the Maritime SWS SG is really which one you like the look of the most – and if you do prefer the look of the Burnt Umber, whether you’re prepared to pay the extra for it. Now we get into some of the other shapes that the Maritime series are available in, starting with the Concert Hall. The Concert Hall version is basically the same as the Maritime SWS SG with one major difference – it’s in Seagull’s concert hall shape. This shape is smaller than the dreadnought and features a more defined waist. See how the Concert Hall shape differs from the Dreadnought and other Seagull shapes in the table below. The main difference with this is that it will produce a noticeably different tone. The tone will be less boomy and bass heavy than the dreadnought model – a more rounded sound and quieter. The smaller size is also easier for kids and smaller adults to handle than a dreadnought. As you can probably guess, this is the Concert Hall version but with electronics. The last of the Maritime models is the Folk model. This is a different shape again from the Concert Hall. The folk shape features a longer upper bout than the Concert Hall model and a less defined waist (less difference in width between the upper bout and lower bout) than the concert hall – but still a slightly more defined waist than the dreadnought. This longer looking, narrower body produces a strong mid-rangey sound and is a great option for finger-style dominant players. A shorter scale length: The Folk versions scale length is 24.84” (631mm) as opposed to the 25.5” (648mm) scale length on the other models. This shorter scale length can make the guitar easier on the fingers and easier to play. It has a high gloss finish as opposed to the semi-gloss featured on the other models. Otherwise it has a lot of similarities too – i.e. solid spruce top, solid mahogany back and sides, 1.8” nut width, etc. This is the same as the first Folk model except that it comes with in-built electronics. There you have the Seagull Maritime Series of acoustic guitars. The most impressive thing about this series for me is that you can get an all solid wood acoustic guitar for such a good price. Whether you go for an electric-acoustic or just an acoustic without electronics, these guitars are a real bargain. If you have any questions or comments or anything to add about the Maritime guitars, feel free to leave a comment in the comments section below.